Music in one form or another was always prevalent in Soflin family home. As tots the girls would fall asleep at night listening to the radio programs their parents had tuned in, such as Kate Smith or The Hit Parade. Their mother would take them to Jeannette MacDonald and Nelson Eddy movies. The WLS National Barn Dance that originated in Chicago was another family favorite over the radio. Mom and dad enjoyed the Vagabonds. Their brother sang in church choirs, school choruses and plays. He would stroll through the house rehearsing and the girls would end up learning the songs. He loved to play music also and began taking organ lessons when he was over 50 years of age. The sisters listened to records by Vernon Dalhart, Henry Burr, Gene Autry, Gene Austin, and even the military bands. Lyn recalls that the two of them never wanted to do anything other than to sing on a radio station. They would sing and harmonize even when they were still very young girls. Lyn says she can remember singing at the age of three years old. She also recalls that when she was just four, listening to a singer named "Hank the Cowhand" over radio station KMMJ, which was then in Clay Center, Nebraska at that time. KMMJ like many other stations in that era featured live talent. As they grew up, the girls continued to sing and found some inspirations. 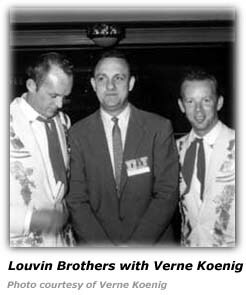 The first to stir their singing ambitions was a male duet team of Roy and Lonnie (Roy McGeorge and Lonnie Robertson) who were appearing on KFAB out of Lincoln, Nebraska. 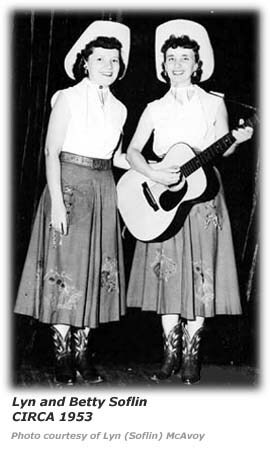 The sisters learned a lot of their songs and while they didn't have a guitar at the time, still spent a good many hours singing together, perfecting their harmonies and style. The next influence in their life came from the husband and wife team of Doc and Esther Embree. In listening to them, the girls realized that Doc and Esther would trade parts at certain places in a song which made for closer harmony. In 1940 or 1941, the gals discovered the Sons of the Pioneers who they considered the masters of trading parts and harmonizing. From then on it became second nature to them, even on the first run through of a new song. The Sons of the Pioneers influenced them all through their career and in the early 1950's became their friends. Around 1939, Betty got her first guitar when she was ten years old. That only increased their musical love as they remember singing—anytime, anywhere. They would tune into several different radio stations and listen to a great number of the entertainers. 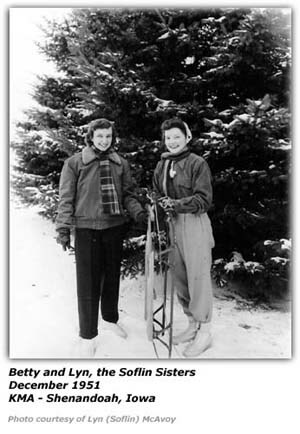 Later, Betty and Lyn found many of them became their friends, co-workers, and even mentors. One in particular was Edmund Denney from WIBW in Topeka, Kansas. Edmund would always have words of encouragement for them and he arranged a guest spot for Betty and Lyn on one of WIBW's group shows. 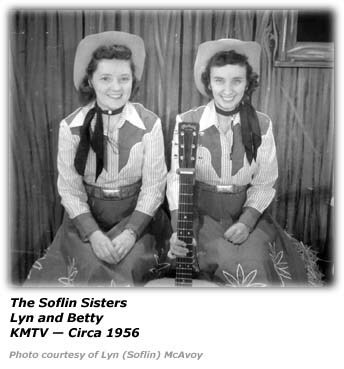 The Soflin Sisters did the usual type of shows around Lincoln where they were born and raised. They appeared at the Otoe County (Nebraska) Fair, organizations, churches, and many other functions. Their appearance at the Otoe County Fair came about when a dance act failed to show up, so the girls were called upon to fill their slot. They did so well, they were invited to return that same evening. Lyn had just graduated from high school when they made an appearance on the Ted Mack Amateur Hour. Then came an offer from KFAB. In the late 1940s, radio station KFOR in Lincoln, (a station that did not use live talent), sponsored an amateur contest and also provided a variety show for various organizations around town. Betty and Lyn did not win the contest but their talents earned them invitations to do many of these shows. In early 1949 they received a telephone call from KFOR asking them to "come in and sing a couple of songs". They had no idea that it was anything special but they did as requested. A number of acts were there and each performed with the others as the audience. The girls left without attaching any special significance to the occasion, but a few weeks later they were informed they were chosen to appear on the national radio program "Ted Mack's Amateur Hour". The Program Director of KFAB heard this program, and with Eddie Sosby's urging, hired them for a limited time at KFAB. 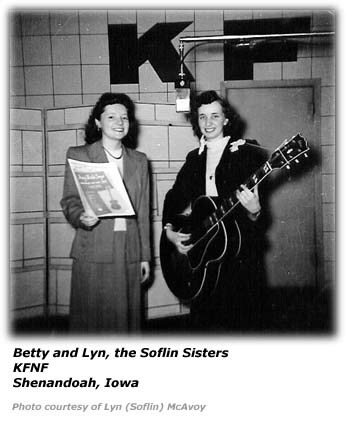 It was August, 1949 when Betty and Lyn began singing on radio station KFAB which at the time was in Lincoln, Nebraska. They were hired to fill in for Eddie Sosby and the Radio Rangers and Texas Mary, who were going on vacation, and to stay on through the Nebraska State Fair which was held the first week in September. When the Fair ended, they were asked to remain until the station completed its move to Omaha, Nebraska in December. They had a daily 15 minute program and appeared on the popular "Hi Neighbor" show with the group. Betty and Lyn had met Eddie and his group a few years earlier in the small town of Beaver City, Nebraska where the girls' uncle and aunt lived. They entered a local amateur contest and they won; they were asked to sing during an appearance that night by Eddie, the Radio Rangers and Mary. When Eddie learned the girls were from Lincoln, he asked them to stop by and sing on their radio show. They did, and the girls felt they "had a toe in the door" for their future radio aspirations. 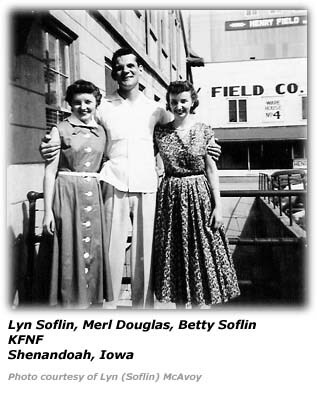 The last week in December of 1949 brought a telephone call from the co-owner of KFNF in Shenandoah, Iowa, Earl Williams, offering Betty and Lyn a job on that station. Again, it was Eddie Sosby who had urged Earl to call the gals. Their dreams of becoming radio entertainers had come true in January, 1950. At that time, Betty was 20 years old and Lyn was 18. 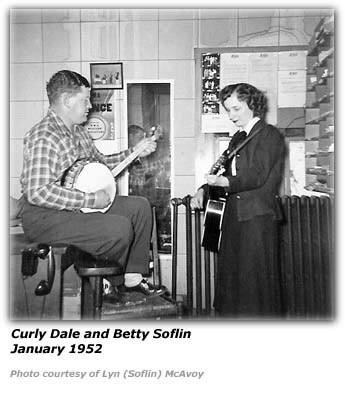 When they joined the staff of KFNF, they got to work with an entertainer they had listened to for years — Curley Dale, widely known in Shenandoah and the surrounding areas. He, too, became a mentor as he suggested better ways for Betty to play the guitar chords as well as showing them new chords. Betty had never used a guitar pick. Curly recommended a particular kind of pick and gave her one, then showed her the best way to use it. The girls found a small, furnished apartment about four blocks from the station. This was a nice walk if it wasn't raining or a biting North wind wasn't blowing. One morning they awoke to find a heavy, deep snow had fallen during the night and the temperature had dropped considerably. Their first program was a group show at 9:00am that morning. After they bundled up and were getting ready to brave the weather and walk to the station, they glanced out the window to find Curly Dale sitting at the curb in his Model T Ford, waiting to drive them to the station. His old Ford was one of the few on the streets that morning. At that time, KFNF carried a staff of five full time entertainers. The five entertainers did a show sponsored by the Perfex Company, called "The Perfex Pals." It was transcribed and sent to six other radio stations in North Dakota, South Dakota, Kansas, Missouri, Nebraska and Iowa. The would record five weekday programs in one afternoon. In addition, Betty and Lyn had their own fifteen minute shows, twice a day. They were also a part of two group shows. They made numerous personal appearances. One memorable one was at one of Shenandoah's "Harvest Day" celebrations that featured a well-known person as speaker—President Harry S. Truman. About a year after the sisters joined the station, some new entertainers were added to the staff. They were known as The Everly Family: Ike, Margaret and their two boys Donnie and Phil (who later gained fame as the Everly Brothers). Don and Phil were in high school at that time. Around July of 1951 the sisters heard that radio station KMA in Shenandoah was interested in hiring them. Since KMA was a 5000 watt station and KFNF only a 1000 watt station, the girls decided to make the change. 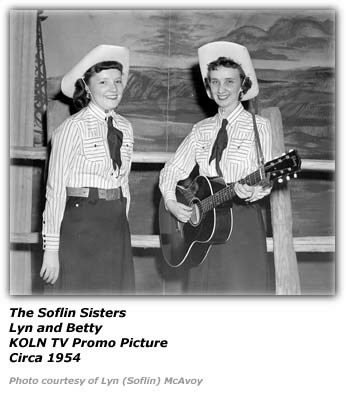 The Soflin Sisters were welcomed to the KMA staff in the August 1951 issue which noted that "...their western, hillbilly and hymn presentations are already well-known to many Midwestern radio listeners." Their debut included a 7:30am show that aired Monday through Saturday and a 2:30pm show that ran Monday through Friday. They also appeared on the "Half Past Noon" show as well as a special Saturday afternoon program. In mid-1951, KMA still had its Country School program on Saturday afternoons. This was a "live" jamboree type show that was popular in that era but was the stage setting was a "country school". The girls were a part of the cast for this show as well. At KMA, they also did their own show, two times a day and one or two group shows. 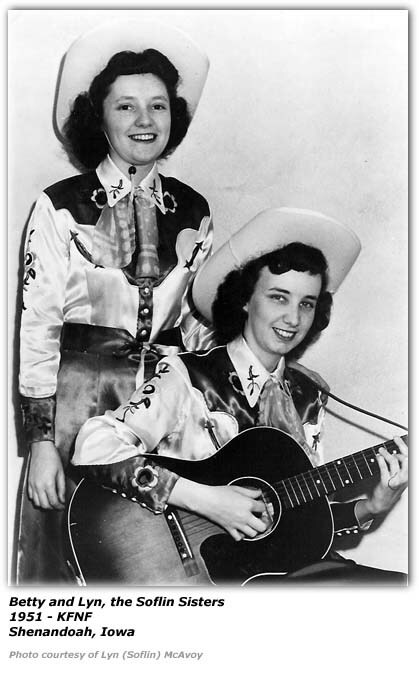 Betty played rhythm guitar for an instrumental show which featured a fiddle, electric guitar, and base fiddle. Their first show was 7:30am. They acquired a baby chick hatchery as sponsor and from then on it sponsored them each year during chick season. Lyn mentions that on their programs they always tried to do a yodel number, a smooth ballad, a hymn as well as an upbeat song to end the program. They also tried to feature some songs the youngsters could enjoy, although the listening audience usually liked their yodel numbers. Later on, an all hymn program was added to their schedule. Our collection of KMA Guides shows several mentions of their shows. 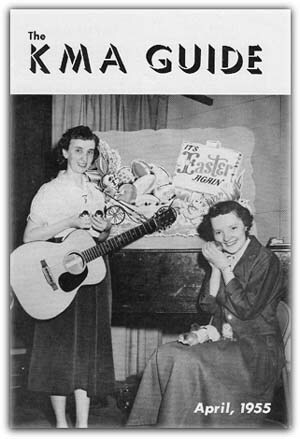 The May 1953 issue mentions that the girls had been "playing and singing their way into the hears of thousands in the KMA area..." and had returned to their old 7:30am morning show, where in August 1951 KMA listeners first heard them. Sometimes their shows were very brief. One such show was a five-minute program sponsored by the Berry Poultry Farms in Clarinda, Iowa. The show aired weekdays at 6:55am and was called the "The Berry Maids". This show first aired on February 9, 1953 and was billed as a "sparkling, novelty program offering songs and clever jingles." 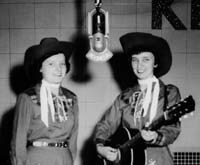 Early in 1952, KMA paired the Soflin Sisters with one of the favorite comedians of the day, Ezra Hawkins and Curly Dale as the "KMA Western Jamboree" to make a series of personal appearances throughout the KMA listening area. The KMA Guide usually included little anecdotes about their staff artists each month so listeners got to know them as if they were a part of a family. Betty and Lyn were said to have some similar tastes such as chicken - fixed that is, sports and both loved to collect records and "what-nots". We don't know if a cuckoo clock would be considered something like that, but in the summer of 1953, their cousin PFC Raymond Metzer sent the sisters a handmade clock that took 20 days to arrive from Augsberry, Germany. The girls were also reunited with Merl Douglas and Curly Dale who had joined KMA earlier and the four of them did a show called "The Double Daters" sponsored by Hy-Vee Food Stores. It first aired on August 18, 1952. The girls did trio numbers with Curly, and Lyn did some duets with Merl. Merl pretty much remained their announcer throughout their years on radio. During this show, they did popular and Western songs of the day and included one hymn on each show. On September 1, 1952, the girls popularity with KMA listeners was such that KMA put them on another show at 12:30pm Monday through Saturday called billing them as the "Dinner Belles". 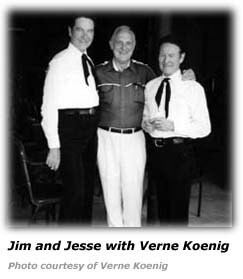 Appearing with them during those shows was Herman Housh, a fiddle player. 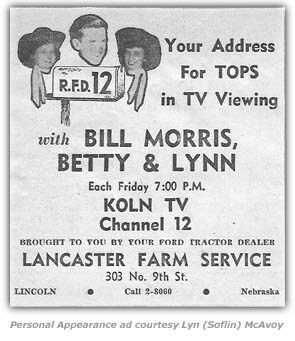 During the summer of 1953, Lyn took on a new show, perhaps a result of their collecting records. It was a disc jockey show in which she tried a novel idea or approach to the show - she talked to the listeners as if she were writing a letter to a friend. During those 'letters', she would give fans the inside scoop on the records, little tidbits about the artists that sang them. The program was to feature a combination of western and popular records of the day. The show was called "Letter from Lyn" and aired at 1:15pm Monday through Saturday. KMA kept the sisters pretty busy. In addition to their own shows, they appeared as part of the cast of other shows. One such show was in spring of 1953 - "The Midwesterner's" that aired Monday through Saturday at 2:05pm. The show featured Buck Dilley, a fiddler; Betty and Lyn, Cowboy Em (Mishler), Coy Martin and Morrie Jones. Perhaps the most difficult radio program they ever had to do was a memorial for two members of the Blackwood Brothers Quartet. R.W. Blackwood and Bill Lyles had perished in a plane crash. Though no longer with KMA at the time of the tragedy, the Blackwood Brothers had been associated with the station for thirteen years and were extremely popular with the listeners. KMA's program director had a phone conversation with James Blackwood the following morning. Their hymn program was extended from l5 minutes to 30 minutes to allow for this. All of them felt profound sorrow for their loss. The Soflin Sisters made a good many personal appearances and as one might expect, some were memorable. Lyn recalls one such unusual appearance. It seemed that Cowboy Em had booked a small gig in a high school auditorium and asked Betty and Lyn to accompany him. However, on the morning of the appearance, Cowboy Em came down with a scratchy throat. By the time they reached their destination, he had lost his voice, in spite of gargling with Listerine the whole distance. He was able to at least emcee the show but could not sing a note. The girls did all the singing but the audience took it in stride and were good sports about it and they got through it. The KMA Guide "On the KMA Party Line Column" by Doris Murphy gave us more details about this appearance. They had gone to Villisca for a matinee show - and Em did make it through that show. But the evening show at the Rialto Theater was another story as noted. This incident would be in the spring of 1953. About this time, or perhaps a little later the gals did a personal appearance in the town of Bellvue, Nebraska. On the same bill was a fellow that was doing a ventriloquist act, by the name of Johnny Carson. Of course, Johnny went on to become a legendary long-time Tonight Show host on NBC. However, that Bellvue appearance was not one the gals would look back on fondly. Another entertainer was with us and on the return trip to Shenandoah they stopped for some supper. While in the restaurant, someone broke into their car and stole everything of value - their Gibson guitar; the new boots and costumes, which they had worn for the first time. They had purchased those costumes in a California western shop. Except for those costumes, their Mother had sewed all their stage wardrobe and they would do the trimming or embroidery work themselves. The thieves also took their carved leather earrings that entertainer Morrie Jones had made for them. He graciously replaced them to their joy as they were quite unusual. The girls' popularity was such that their talents were getting noticed. They received an offer to join the staff of WLW in Cincinnati, Ohio. They discussed it and one factor they took into account was that the duties of WLW's entertainers consisted mostly of touring and making personal appearances. The gals liked doing appearances and meeting the fans, but their first love was radio. They decided not to join WLW. No one could conceive of all these radio stations without live talent. But when James Petrillo, President of the National Musicians Union released the ban on playing commercial records by popular artists, Lyn felt they should have had a clue about the future. For what turned out to be their final year and a half, their first show was at 5:00am, again, with Merl Douglas. But many of the other entertainers were gone by this time. They had their show at 7:30am and a hymn program at 11:30am. However, KMA and other radio stations were beginning to phase out the use of live talent and began to release the entertainers from their staffs. 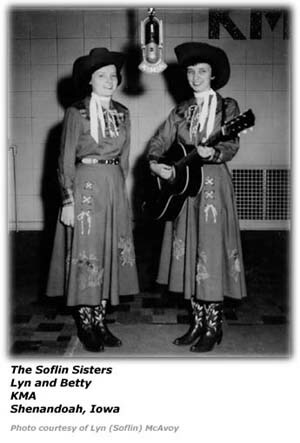 The Soflin Sisters were to be the last of KMA's entertainers. 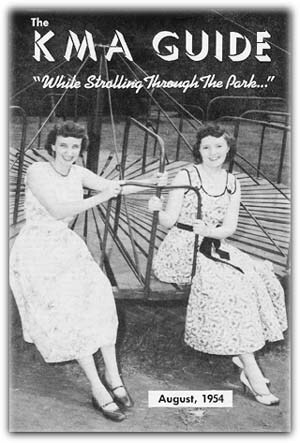 In November of 1955 the Soflin Sisters were also released. One of the things the sisters got special enjoyment from while doing their radio programs was being able to bring in their nieces and nephews, who were old enough, to sing a song or two. They were proud of the kids and the listeners always wrote in to say they had enjoyed their singing, too. Their ages ranged from four to eleven. Their 11 year-old nephew sang on the Perfex Pals show. At home, special occasions and Holidays always included a whole lot of singing by everybody in the family. They decided it was time to take a little vacation and visit some old friends. They ended up doing guest appearances on WHO, Des Moines, Iowa; KMMJ. Grand Island, Nebraska; and KRVN in Lexington, Nebraska. After leaving KMA, they returned to their hometown of Lincoln. They did personal appearances and some local television programs. Once again, Eddie Sosby called and they did a weekly TV show on KMTV in Omaha with him and his group. These shows were to be the first local programs to be televised in color. As a result, many more personal appearances followed. They continued this routine for several years until the TV show finally went off the air. About this time a Lincoln television station, KOLN-TV, called and asked them to do some appearances with the group who was doing a ten minute live TV show for them. They did a few but the girls had decided it was time to retire. Betty had begun a new career and Lyn had married. It would be many years later before they learned that the Marty Martin they did those shows with had become BoxCar Willie. Both Betty and Lyn still live in Lincoln, Nebraska. Betty retired some years back after a rewarding career as a Special Gift Wrapper and then a Window Designer for a large department store in Lincoln. She received several awards for her skill in the Display Department and in designing. Lyn married in 1957 and she and her husband have a daughter and a son. Two granddaughters round out the family. "The old radio days will never be equaled when it comes to pure entertainment. It was fun and it was rewarding. 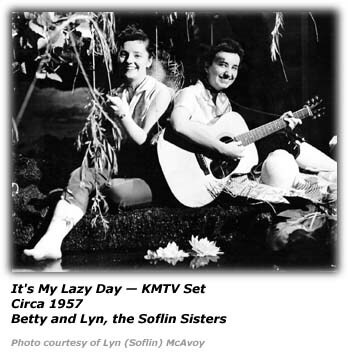 Betty and Lyn, The Soflin Sisters, were happy to have been a part of it. " Hillbilly-Music.com wishes to express its appreciation to Lyn Soflin for working with her sister to provide the writeup and photos for this article.